In other news, I’ve ripped back Rock Island due to right side/wrong side confusion, and am making good progress with Balrog. More coming soon on those. Finally, I yesterday submitted my final piece of postgrad work. I’m so relieved it’s over, and am glad to have a few days of knitting and relaxing before I start looking for jobs. Postgrad was exhausting! Well, WIP land is moving along. 1. I have finished seaming the Farmer’s Market sweater. Tomorrow: blocking. No idea how long it’ll take to dry, though. The weather is ghastly. 3. Balrog is chugging along at it’s usual sedate pace, but it’s getting done. 4. I have 4 days before my dissertation is due at the printers and it still needs a lot of work. I’ve taken tomorrow off work so I have time to fix the problems. Thank heavens I can read and knit at the same time. That’s all for WIP Saturday (which will become more regular now that holiday season is done with). What’s everyone else working on? Well, it is the end of the week. I realise most people class Sunday as the last day – so do I, really – but since I work Sundays my last day is frequently my busiest. So I’ve reassigned it. Anyway, since it is the last day of the week, I thought I’d report back on the progress of my WIP-down. Annis, as you know, is complete. The Farmer’s Market cardigan has had all ends woven in and pockets seamed. I now need to seam the sleeves and collar. I hope to have the sleeves sewn on by next Saturday and possibly the whole cardigan finished by the end of the month. That would be nice. I have cast on a new project. 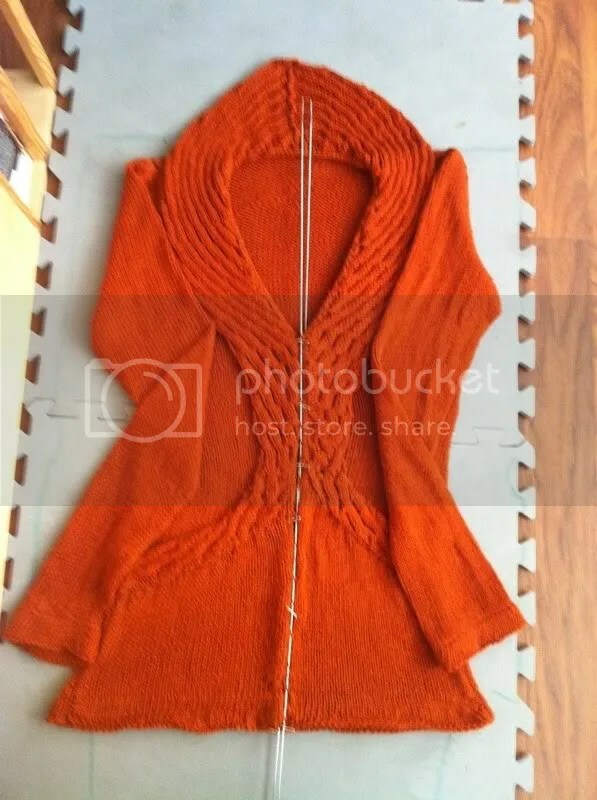 I know, I know, I have a million things waiting for attention, and Rogue hovering beside me, but this is a test knit for the very talented Susan Pandorf. 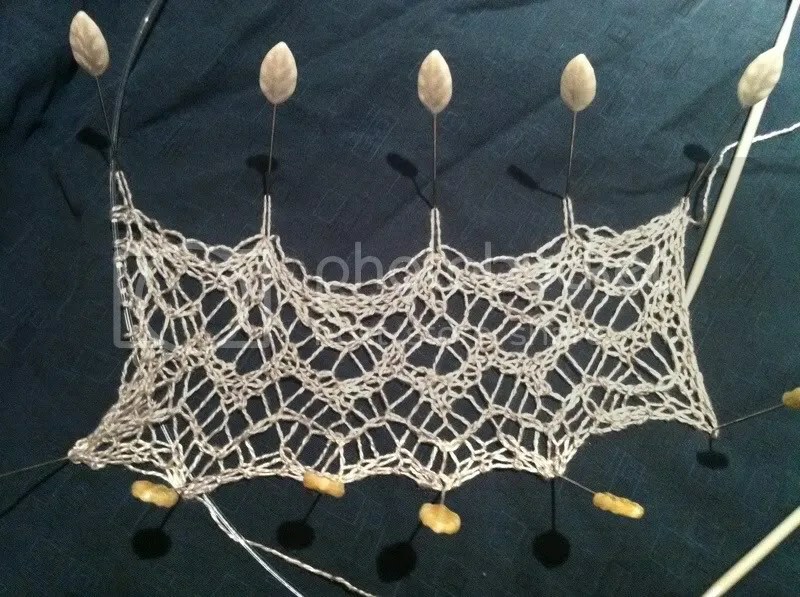 Check out her pattern pages; her designs are works of art. I’ve done Evenstar and (almost) In Dreams so far. I have the pattern for Argonath and Rivendell is about half done. This pattern is Balrog and I am pleased to report that it is a quick knit and very easily memorised. I think it might be going even faster if I’d had the right yarn in the stash but all I had was DK. Everything but my lace and sock stash is pretty small. So I’ve had to go down a needle size to get gauge and that’s made my knitting very tight. But that’s to do with my lack of available funds for new yarn (and my desire to stashdown) rather than pattern problems. The pattern, as ever, is a joy to knit. Why have I never tried mosaic knitting before? What is everyone else knitting right now? Anyone else trying to vanquish the WIPs? Let me know, and I’ll be back next Saturday, if not before, hopefully with some progress.